It was a fantastic Tuesday for the animal lovers who gathered in Vancouver to cuddle with adoptable puppies. With eight cuddly furballs on hand to snuggle, the sounds of pure happiness filled the lobby of TELUS Garden, where the BC SPCA held a pop-up event, Cupcakes and Cuddles, to help raise funds and awareness for National Cupcake Day™, a cross-Canada fundraiser to help animals in need. 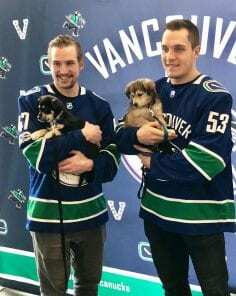 Vancouver Canucks forwards Sven Baertschi and Bo Horvat dropped by as special guests, to get their own puppy cuddles and also, to raise funds for the province’s most vulnerable animals. Along with cupcakes to satisfy sweet cravings, the event proved popular for animal lovers, Canucks fans and cupcake aficionados. Find out more about National Cupcake Day™ at nationalcupcakeday.ca. Looking for a little pre-Valentine’s day snuggle? The BC SPCA is inviting animal lovers to drop by the second annual Cupcakes and Cuddles pop-up event on Tuesday, Feb. 13 in downtown Vancouver. 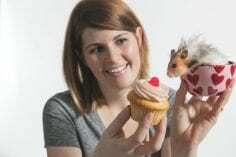 Participants will be able to cuddle with animals, enjoy a cupcake and even get a chance to pose for a photo with two Vancouver Canucks hockey players, all while raising money for National Cupcake Day™, a cross-country fundraiser to help animals in need. The event is being held in the lobby of TELUS Garden, at 510 West Georgia Street, from 11 a.m. to 2 p.m. TICKETS AVAILABLE AT THE DOOR. For a $20 donation, visitors can cuddle animals and enjoy a delicious cupcake. Space permitting. All funds raised at the event will support abused and homeless animals in the BC SPCA’s care. Vancouver Canucks forwards Sven Baertschi and Bo Horvat will be in attendance from 1:15-2 p.m. to help raise awareness about the cause. They will be available for photos for an additional $20 donation. This year, National Cupcake Day™ falls on Monday Feb. 26, but participants are fundraising all month long. Since the campaign’s inception in 2013, $2.45 million has been raised, with proceeds going to participating SPCAs and humane societies across Canada. “In addition to supporting this event, we want to encourage people to sign up and to host their own cupcake parties,” says Matisic.